A 13-year-old female presented with acute-onset pain and redness in the left eye with a history of poor vision in that eye. On examination, a port-wine stain was present involving the ipsilateral eyelids, and the vision in the affected eye was no perception of light with elevated intraocular pressure and indirect ophthalmoscopy showing total retinal detachment. Ultrasonography B-scan showed a dome-shaped lesion with smooth contours and high irregular internal reflectivity and total retinal detachment suggestive of a circumscribed choroidal hemangioma. The patient was treated symptomatically for pain and elevated intraocular pressure. Neurology and oncology opinion was sought for systemic evaluation and radiotherapy. Sturge–Weber syndrome (SWS) is a rare systemic disorder. It belongs to a group of disorders called phakomatoses which are neurocutaneous anomalies involving structures arising from the embryonic ectoderm. It classically has a triad of facial port-wine stain, leptomeningeal capillary-venous malformations, and ocular abnormalities. Here, we describe a rare case of circumscribed choroidal hemangioma associated with SWS. A 13-year-old female patient came with the chief complaints of pain and redness in the left eye for 2 days, severe vision loss in the left eye for many months, and with a history of poor vision in the same eye. There was a history of reddish discoloration of the left side of the face since birth. There was no history of similar illness in family. There was no history of systemic illness or mental retardation or seizures. Systemic evaluation involving full central nervous system (CNS) evaluation was normal. A facial port-wine stain was present involving the left upper and lower lid [Figure 1]. On examination of the left eye, vision was perception of light absent. Slit-lamp examination of the left eye showed tortuous episcleral vessels, corneal stromal haze, shallow anterior chamber, fixed mid-dilated pupil, and leukocoria. On applanation tonometry, the intraocular pressure was 42 mmHg. The angle view was hazy on gonioscopy due to corneal stromal haze. Indirect ophthalmoscopy evaluation showed total retinal detachment. The right eye examination was within normal limits. 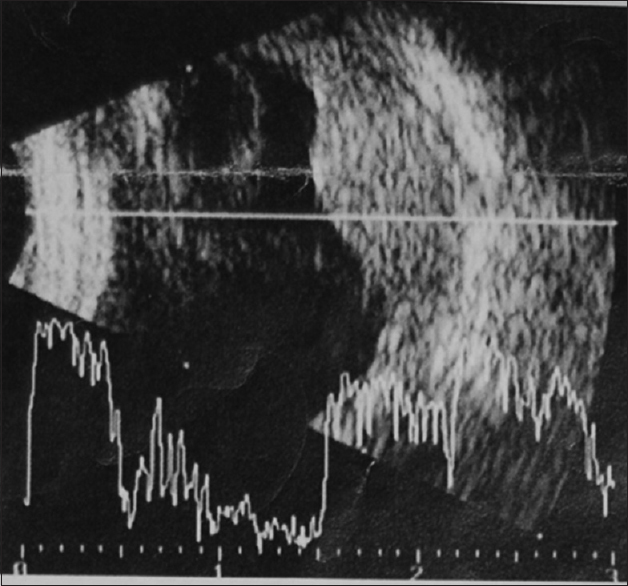 Ultrasound B-scan showed a well-circumscribed dome-shaped lesion with smooth contours and high irregular internal reflectivity along with a total exudative retinal detachment [Figure 2]. No choroidal excavation was present. Magnetic resonance angiography of the brain with orbit showed 15 mm/7 mm choroid-based lesion with normal neuroparenchyma. A diagnosis of circumscribed choroidal hemangioma with secondary glaucoma and exudative retinal detachment in a case of SWS was made. The patient was treated symptomatically with topical and oral antiglaucoma agents. Retrobulbar injection of absolute alcohol was given for pain control. Neurology opinion was taken, and oncology reference was made for radiotherapy. The patient is currently symptom free and on need-based follow-up. The vision loss was irreversible. SWS is a rare sporadic congenital disorder characterized by vascular malformations involving the CNS, skin, and eyes. Its typical manifestations include a cutaneous port-wine stain in the distribution of trigeminal nerve, glaucoma, choroidal hemangiomas, leptomeningeal hemangiomas, and seizures. The nevus flammeus or port-wine stain consists of patchy red discoloration of the skin in the distribution of trigeminal nerve. The neurological manifestations of SWS are due to the leptomeningeal hemangiomas which are generally distributed in the parietal and occipital regions ipsilateral to the side of the port-wine stain. Primary neurological symptoms of SWS include seizures, headaches, stroke-like episodes, hemiparesis, visual field deficits, and cognitive impairments. Neuroimaging shows the characteristic tram-track sign of cortical and subcortical calcifications and cerebrovascular malformations. The ocular manifestations of SWS include vascular malformations in the anterior as well as posterior segment of the eye and glaucoma secondary to elevated episcleral pressure. The characteristic choroidal lesion in SWS is a diffuse choroidal hemangioma (tomato-catsup fundus). Circumscribed choroidal hemangiomas occur as unilateral lesion without systemic associations and are considered congenital in origin. However, in this case, the lesion was a circumscribed choroidal hemangioma with the patient presenting as painful blind eye with secondary glaucoma and total exudative retinal detachment. Thus, our case highlights that circumscribed choroidal hemangiomas can be considered as rare associations of SWS and may be arising similarly as other vascular malformations seen in this disorder. Karimi S, Nourinia R, Mashayekhi A. Circumscribed choroidal hemangioma. J Ophthalmic Vis Res 2015;10:320-8. Scott IU, Alexandrakis G, Cordahi GJ, Murray TG. Diffuse and circumscribed choroidal hemangiomas in a patient with sturge-weber syndrome. Arch Ophthalmol 1999;117:406-7. Cheung D, Grey R, Rennie I. Circumscribed choroidal haemangioma in a patient with Sturge Weber syndrome. Eye (Lond) 2000;14 (Pt 2):238-40. Yin XL, Ye J, Yuan RD, Ji SX. A case of circumscribed choroidal hemangioma in sturge-weber syndrome in china. Int J Ophthalmol 2011;4:210-1. Thomas-Sohl KA, Vaslow DF, Maria BL. Sturge-weber syndrome: A review. Pediatr Neurol 2004;30:303-10.